Dietary advice from the eighteenth century: hold the cream after dinner & the rum at breakfast; have a tea latte! By being too rich, is improper for weak stomachs, liable to turn rancid, and difficult of digestion. Upon strong stomachs, which can digest it, it is very nourishing. 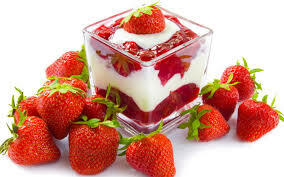 It is an unwholesome custom to eat cream or milk with apple-pies, strawberries, &c. &c. directly after dinner, if you mean to drink wine; for the wine ferments, coagulates the cream, and makes the whole mass hard of digestion: and upon weak stomachs, such a mixture will promote sickness, vomiting, &c. This I myself have experienced more than once. –from Thomas J. Hayes, Concise Observations on the Nature of our Common Food, So Far as it Tends to Promote or Injure Health (New York, Swordses for Barry & Rogers, 1790), 22. Maybe he was a slow learner? That’s too bad–strawberries and cream are delish. He seems to be a little obsessed with imagining what his bile is up to when it meets milk and cream–it’s like he thinks it’s a cheese shop, and we all know the dangers of cheese and curds: they are “apt to produce costiveness” (that is, constipation), 21. Drinking rum and milk in a morning is a very unwholesome custom: rich milk alone is often too heavy for weak stomachs, and when rum, which is an inflammable spirit, is mixed with it, of course becomes more pernicious. Instead of rum and milk, use the following, as it is much more wholesome. Take a large tea-spoonful of common bohea tea, with about three lumps of sugar; put them into a bason, and pour upon them a quarter of a pint of boiling water; cover it over and let it stand all night; in the morning pour it off clear, and add about a quarter of a pint of new milk: drink it fasting, an hour or two before breakfast, (22). Perfect for a beverage on a hot July morning! Maybe a little sweet to our tastes, but remember–in the eighteenth century, people still believed that sugar had medicinal properties, probably because it was (compared to our contemporary food environment in North America) relatively expensive and hard to come by. Also, most of us would either heat it up again or plunk some ice cubes into it–but both heating and cooling beverages like that was probably seen as an extravagant waste of energy. Room temperature was the way that most beverages were served in most places until well into the nineteenth century. I’m with him on the no-dairy, as are most adult humans. But you’ll have to pry my rum out of my cold, dead hands. From what I can tell, people drank tons more in the past than we do now. Of course, Historiann, you’ve probably got a more accurate picture of this than I do — I’m going by novels, plays, and poetry, which probably vary wildly from fact. According to the oracle at Google, the bile-phlegm-blood medical model was “the foundation of mainstream Western medicine well into the 1800s.” So your author was right on track. I think the weak v. strong contrast is interesting. A strong person can hold his ale (or his cream) while a weak one cannot. Maybe somebody can clarify this but it seems to me that drinkers, even heavy ones, are socially okay but drunkards are not, the distinction resting with the degree of control. I’ve been revisiting some of Shakespeare’s plays lately and these contrasts are all over the place. The thing that always strikes me about these manuals/pamphlets/books is how similar they are to our modern iterations of what’s now nutritionally good v. bad. Some of the advice is the same (eat your veggies! ), while some is different (concerns about “weak stomachs”), but what doesn’t change is that Anglo-Americans are so interested in applying the metric of virtue to food and drink. Lately, I’ve been hearing a lot about “eating clean.” If that’s not about virtue (versus sin/corruption/filth/etc. ), then I don’t know from virtue. I don’t even know what “eating clean” means, except that it seems to be another way of describing veganism. Yikes. You’d be able to tan leather in that brew. Or was it supposed to be diluted before drinking? The business about Anglo-Americans, food and virtue is right on target. Funny to see how far back it goes and, as you say, how similar it was. Substitute “gluten” for “cream” and you’re in the present! Substitute “gluten” for “cream” and you’re in the present! What a day to read this! I’m trapped in the middle of a deep, dark forested archival compound that’s strong on wifi and primary sources; week to nonexistent on the comestible side. If I had a bottle of Captain Morgan, I’d pour the whole thing on a downed oak branch and see what they mean by this “strong” v. “weak” stomach part. Technically speaking, there are some food purveyors off-island, but the road system is so crazed here you might never come back. I did locate a vending machine today, but it made only a small dent in that “gnawing famine” feel that makes even manuscript gems blur a little. I should have just read up on things and packed in a week’s supply of edibles. When you’re used to doing research in noisy, honking urban places, you lose touch with these things. I think I’m going to make a run for it now. There’s got to be something I’m missing. I’m glad I didn’t come over on the blog side, though, until they came around to retrieve the manuscripts. … And then I’ll probably have trouble even finding a “bason” in the cute but rude cottage where I’m staying! I never drink booze until the evening, but I have to say, a nice cool glass of rum and diet coke for breakfast sounds kind of appealing. I used this: http://digital.lib.msu.edu/projects/cookbooks/ in my American Culture class. Fun times. One of the assignments was to make a recipe using the earlier models and record your efforts. Most didn’t turn out and those that did were frequently…., icky. Not the least of the problem was that you already had to know how to cook to follow the recipe. Directions like “put in a hot oven until done” were useless for my students, some of whom had never done more than microwave. I one young man is a pretty good baker and it took him four or five tries to get biscuits to turn out. (And that was after he gave up on a rice pudding that was, at least in appearance in the video he made documenting his attempt to make it, disgusting). What a great idea! There are modern guidelines for what a “hot,” “moderately hot,” or “slow” oven might be. I love the education both in the history of American foodways and in cooking or baking itself! The other problem is that our ingredients are not the same — our flour is more refined, so is the sugar, milk has less fat in it. Etc. So even if you know what bohea tea is, it may be impossible to purchase. That was clearly the problem with the rice pudding. The ingredients simply wouldn’t set no matter how long he cooked it. I’ll see if I can get permission to post his video and blog submission. Serve it forth, indeed! I was with you until the part about tempering up with “ayren.” What’s ayren? Does that mean just pound up the fresh cheese to make it fluffy with air?